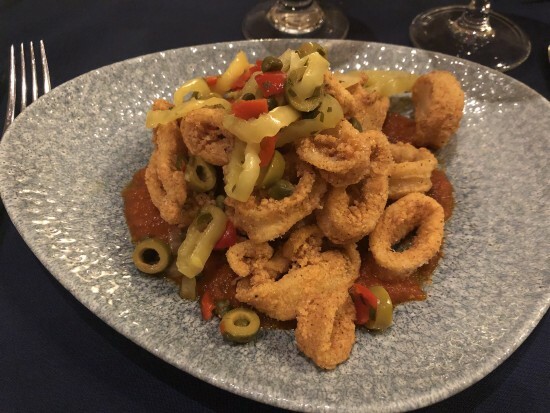 Foody Forty in Florida - Nov/Dec 2018 - COMPLETE! 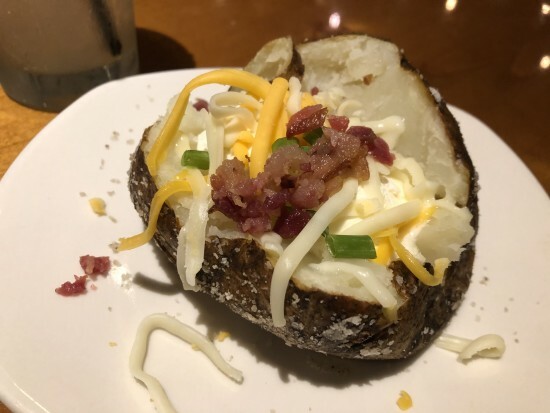 I’ve learned a lot from reading everyone’s food reports, so I thought I’d try to contribute one of my own in the hopes of helping others in a similar fashion! This trip is to celebrate my fortieth birthday (which was in the summer). We have no kids so it’s just me and DH. We’re staying in the Point resort by International Drive/Universal Blvd for three nights, then we have 12 nights at the Wilderness Lodge with DDP (I’m most excited about this as although we’ve visited Florida many times, this is our first onsite trip) and we finish with three nights at RPR. 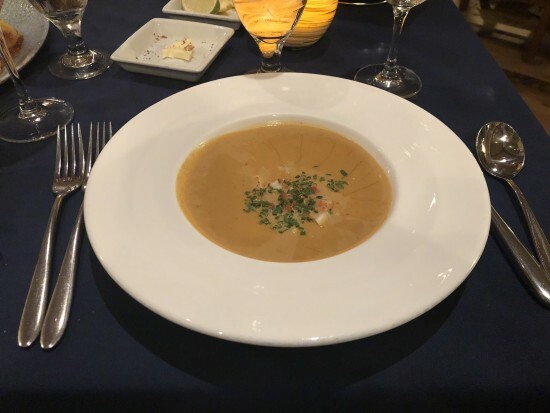 We really enjoy going out to eat, and we’re not that fussy - we will eat most things and as far as we’re concerned there’s a time and a place for both chains and fine dining! We were up at stupid o’clock for our flight to Gatwick. Everything went smoothly and we were actually at the airport before the BA lounge opened! One we were allowed in, I had some yogurt and tea; they do have warm ham and cheese croissants now but I was trying not to peak too early! 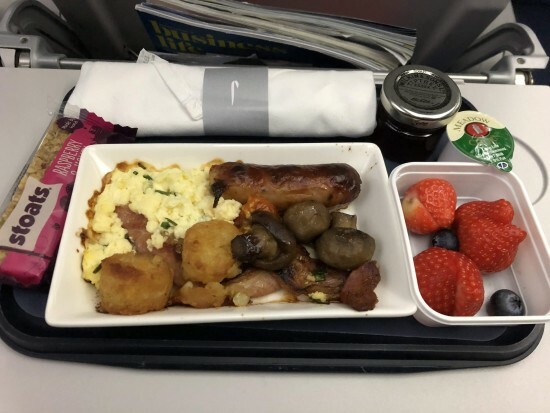 This is because, as we were flying Club, I knew we’d get the cooked breakfast on the plane. 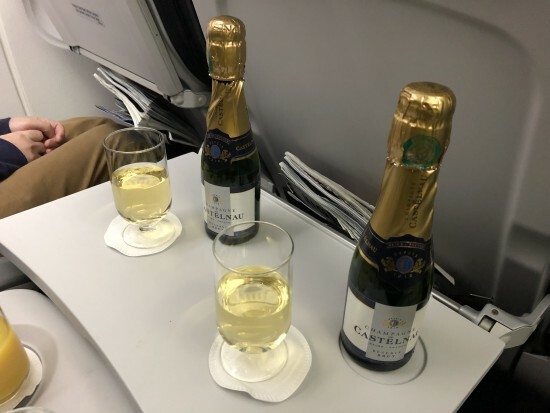 The cabin crew were great and offered champagne when they realised we were going on holiday, so being good went out the window! 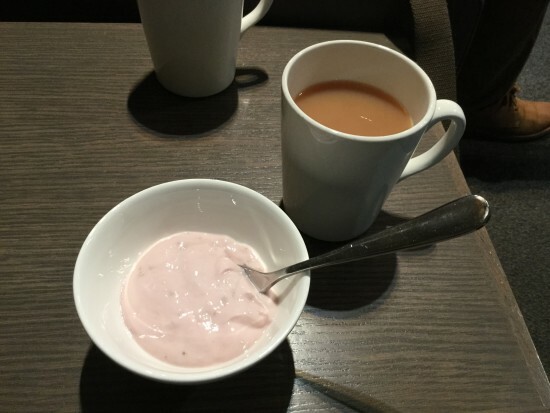 We arrived in Gatwick on time and headed for the lounge there for our third breakfast. I also had some kettle chips later but stuck to tea and water as I wanted to be hydrated for the flight. 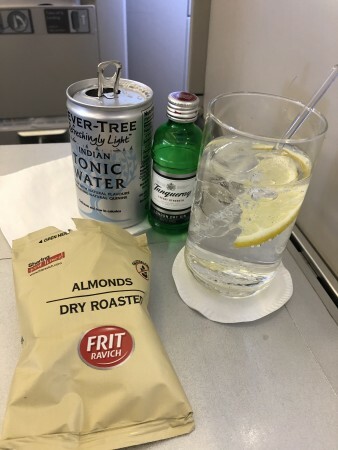 Our flight was delayed for about 40 minutes but once on board I had a pre-dinner G&T with almonds. Then it was time for lunch. I had Sauvignon Blanc with this, which is the kind of wine I really enjoy. 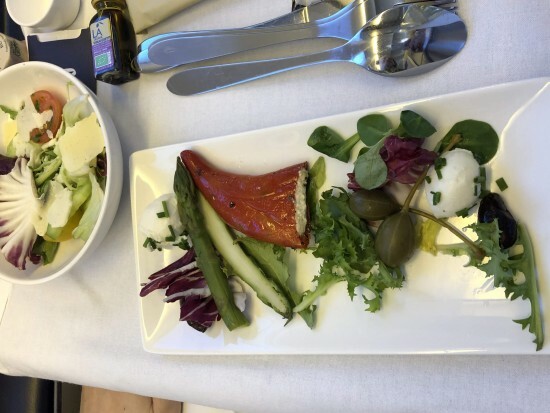 I skipped a starter as neither appealed, while DH went for the stuffed pepper but didn’t think much of it. 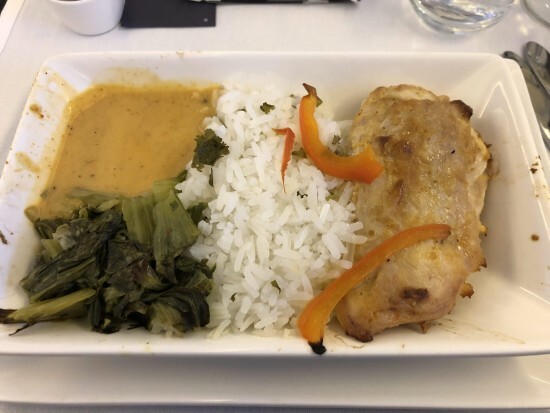 The mains were good though - I would have liked more of the massaman sauce with my chicken as it was delicious and fragrant, and my husband enjoyed most of the steak although the edge was a little dry. 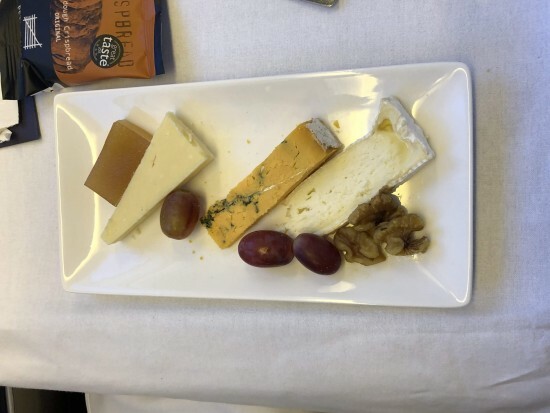 We shared cheese and the citrus delice for dessert - the former was more successful as the delice was unfortunately mostly soggy and flavourless. I had a baileys afterwards, I do have a picture but am not sharing it as it’s a bit dull LOL. During the flight I visited the club kitchen for some fizzy juice and chocolate, again the photo is too boring to show (plus I took it after everything was finished, oops!). 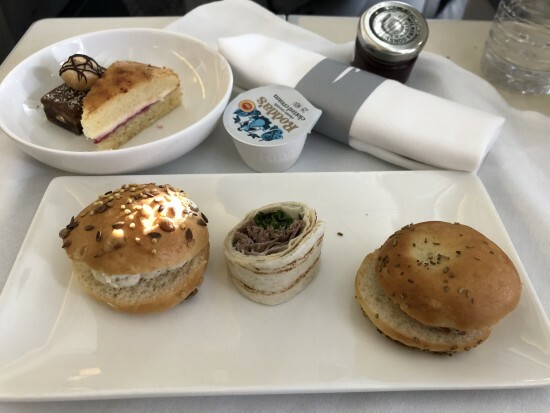 Before landing into Tampa we had afternoon tea; I’m not a great flier so normally don’t eat this, but I actually felt good this time and enjoyed the sandwiches, the chocolate cake and the scone (not pictured but with jam then cream, of course!). We were off the plane, through immigration and had our bags within 30 minutes, which was great - but then disaster struck and we waited an hour and twenty minutes for our hire car . 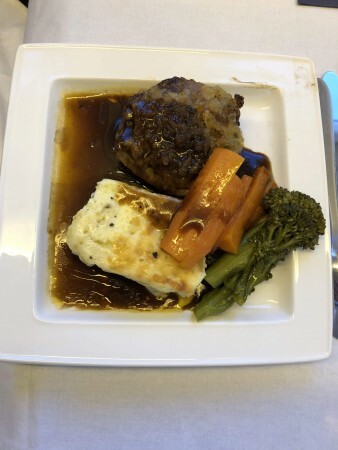 By the time we had the car and had driven the hour to the International Drive area, all we wanted was bed - so thanks to BA for supplying all our food for the day! A great start to travel day with champagne. I'm looking forward to the rest of your trip. My husband was entertained as I’d just finished saying that I’d probably avoid alcohol until we got on the long haul flight, but you can’t turn down free champagne right?! We were up ridiculously early but that’s ok because it’s Black Friday and the shops are already open! We’ve flown to Florida on Thanksgiving once before so had a rough plan of what we wanted to do. 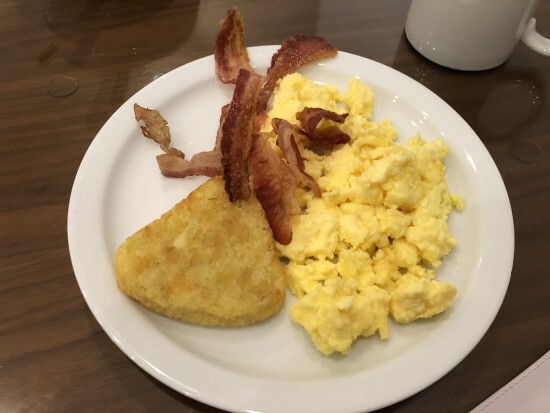 We do have a complimentary breakfast in our hotel rate but that didn’t start until 7, so we skipped breakfast in favour of being in the Florida mall by that time! 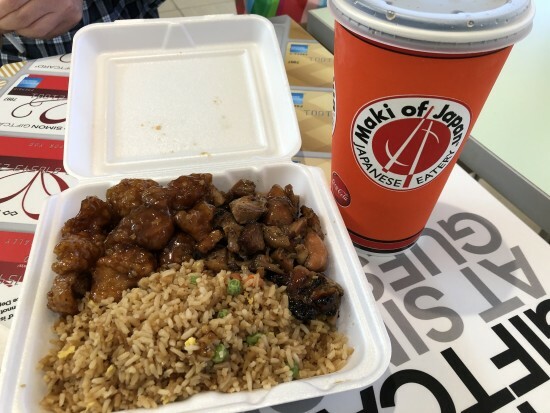 We shared a two entree combo - bourbon chicken and orange chicken, with rice - and a large Diet Coke. This was just under $13 and was quickly demolished. We went back to the hotel to drop off stuff and take a nap before heading out again. We knew by this time that both premium outlets would be packed, so instead we headed for the factory outlet at Lake Buena Vista (mostly for Old Navy and GAP). It was also busy but we luckily got a space quickly and shopped, then headed on to both Walmart and Target to get some Barbie stuff requested for my niece. We also picked up some in room snacks as well as bottled water. 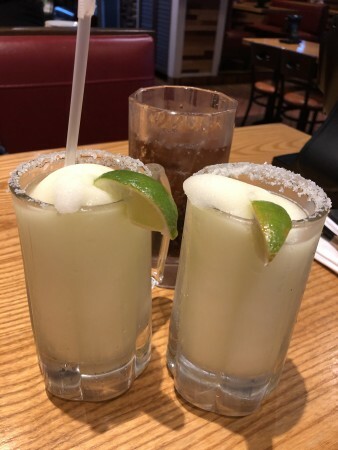 Holiday margaritas are the best, especially when it’s happy hour and only $5! The bread turned up - I normally love bread but I’m not a huge fan of this kind, so I only had a small piece. We didn’t finish this because knowing what was to come, we didn’t want to fill up on bread. We also ordered a blooming petals to share first. Sometimes it can be greasy but this one wasn’t at all and we loved the spicy coating. It is best eaten hot though - we didn’t finish it as it wasn’t as nice as it cooled (still ate most of it LOL). 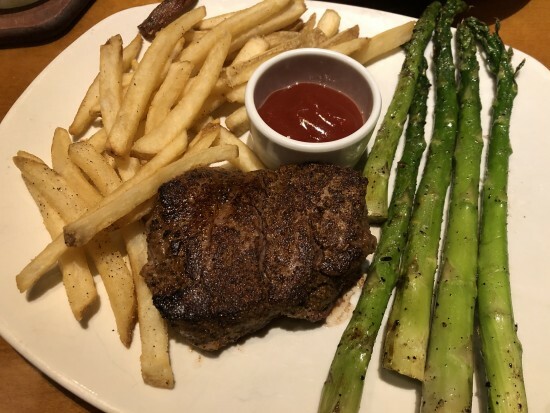 The steak was cooked medium-rare as I’d requested and I ate all of it and the asparagus, plus most of the baked potato and a couple of bonus fries. He enjoyed all of this and especially the shrimp - he let me try one and they were indeed coconutty! 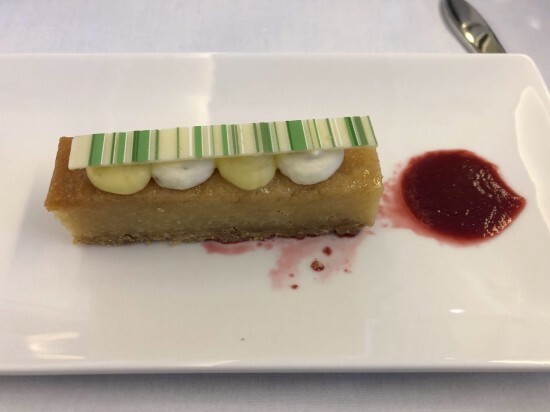 We were too full for dessert so asked for the check. The above came to just over $58 (from memory) and we left $70 to include a tip. 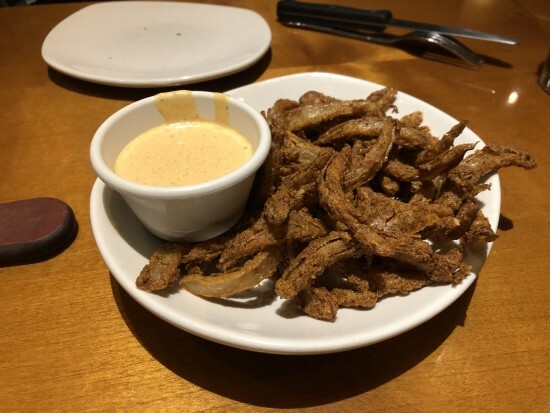 We love Outback and had another great meal but it can be relatively expensive when compared to other chains. 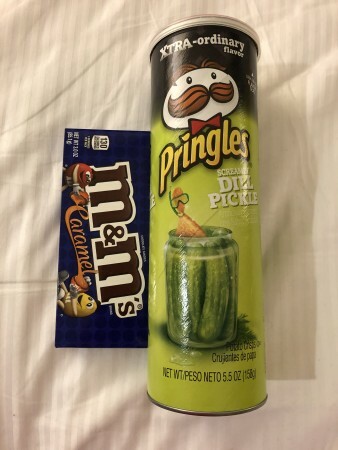 We had a short walk to stretch our legs then back to the hotel where both the Pringles and M&Ms were later opened! We were up early again and wanted to hit the outlets, but as they didn’t open until 8am we had time to eat. 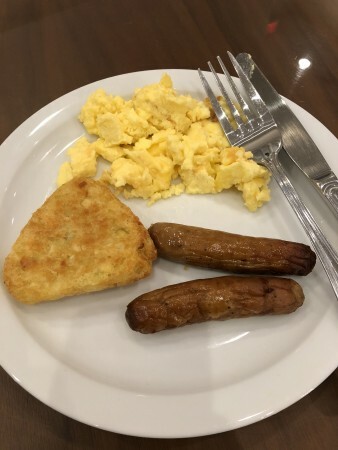 When planning I didn’t realise we had a breakfast inclusive rate so was thinking about going to Denny’s; however DH objected to spending money when we had free food (watch this space for later though!) so off to the breakfast room we went! It was a small area but there was a good selection. 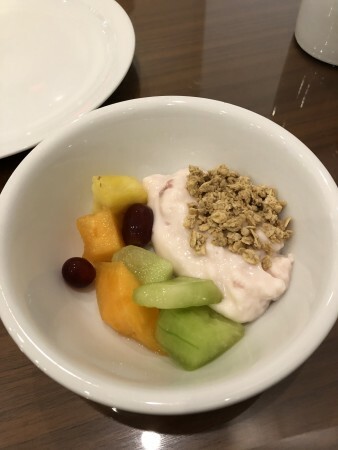 I had strawberry yogurt with granola, grapes and melon, then eggs, sausage and a hash brown, but they also had cereal, grits, pancakes and bagels. It was all fresh too, but not particularly hot. They also had a selection of fruit juices and tea/coffee. I enjoyed what I ate. DH refused to let me take pics of his breakfast, spoilsport! We got to the outlets shortly before they opened, the security guard was checking where everyone was going before directing you to park but we got a space easily. We spent a happy 2.5 hours shopping, then headed back to the hotel for a nap and more Pringles. After a brief rest, we decided to head to the Mall at Millenia. 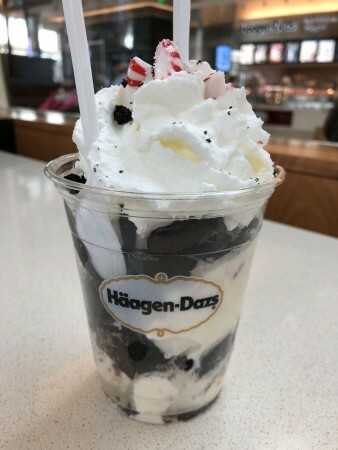 When we passed the food court we saw Haagen Dazs were selling peppermint bark ice cream. I developed an addiction to peppermint bark when we last visited Florida during thanksgiving (I make my own at home every year now) so I was set on having the limited edition dazzler sundae. DH was happy to share it too! It was delicious! And just under $8. After yet more shopping and the purchase of two bundt tins for my home baking, we headed to Super Target across the road. When we didn’t buy anything, we knew we were finally shopped out and decided to head for dinner! 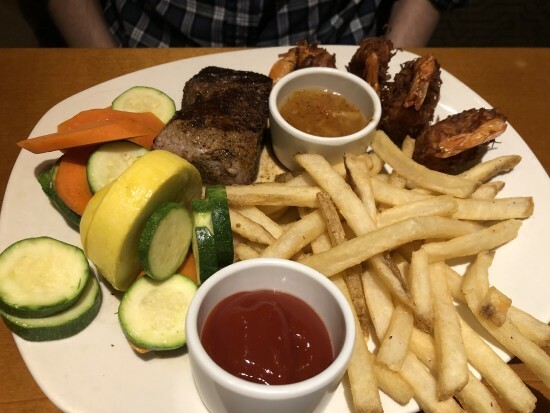 We went to Chili’s on Apopka-Vineland (after stopping at the one on International Drive, which was busy and didn’t look all that clean, which made me uncomfortable). 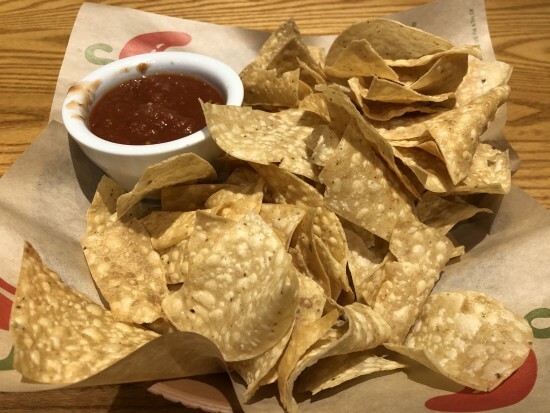 We were seated immediately and promptly ordered what we always order at Chili’s. DH’s designated driver Coke sneaked into my pic! 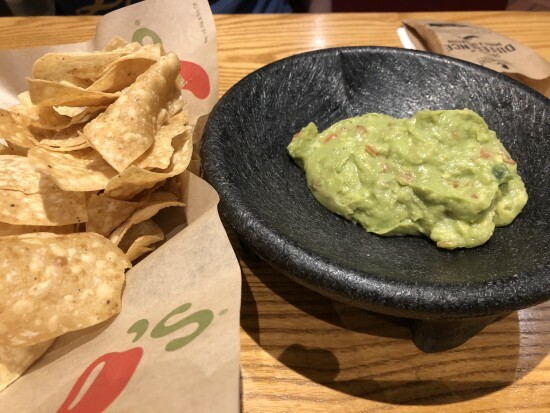 We then shared chips and guacamole (a server at Chili’s once explained to me that since it also comes with salsa, ordering this is the way to get guacamole for free, rather than just ordering the chips and salsa than adding guacamole later - I’ve never forgotten LOL). 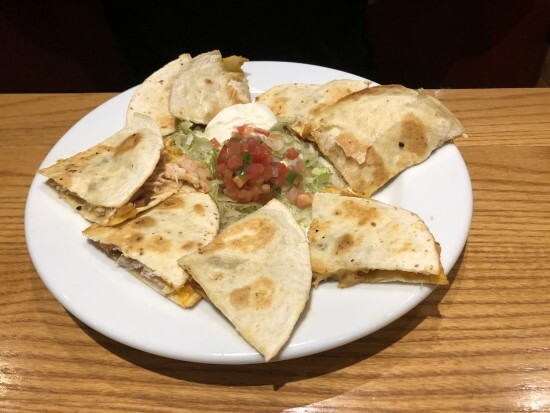 For entree I ordered bacon ranch chicken quesadilla, and I surprised myself by eating all of this, as it was a huge portion as usual. 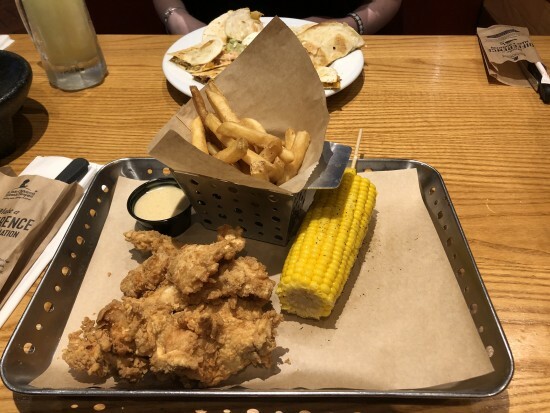 Husband ordered his usual chicken crispers, although he went plain crispy this time while he normally goes for honey-chipotle. He really enjoyed these too, I tried one and it was nice and crispy. Anyway as our meal was on the 2 for $25 menu, all of the above came to just over $33 and we left $40 to include a tip. To me, that’s a really delicious bargain! the steel family - WL here we come! Again I’d had other plans for breakfast but the lure of free food was too much for my husband (until later in the day anyway) so we were at breakfast in the hotel just before 8. 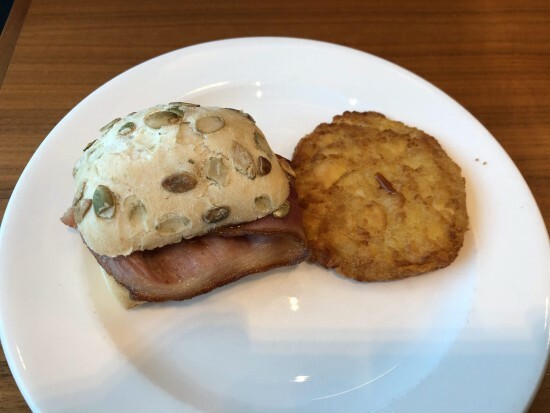 Some slight variations in menu from the day before - they were offering French toast rather than pancakes, oatmeal rather than grits, bacon rather than sausages and pineapple rather than melon. You hand in your breakfast voucher and get all of your crockery and cutlery in return, then you help yourself. 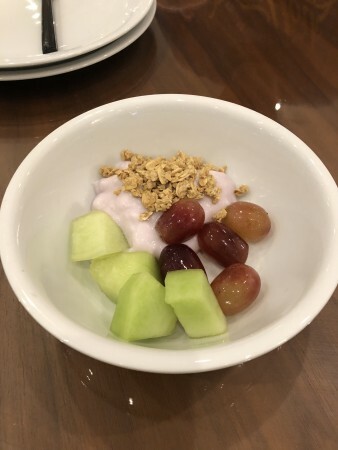 I had yogurt, granola and fruit again, then bacon (love US bacon, so crispy), eggs and a hash brown. After that we returned to the room and repacked the bags to fit in all our Black Friday purchases, before checking out and heading for the Wilderness Lodge! I’d done online check in and our room was ready as we arrived at 11.30, which I was surprised about given how busy I assume it would have been over thanksgiving. I had done a room request with Touring Plans and while we didn’t get the exact room, I could tell from the room number that it was in the right location - a fifth floor view of the Contemporary and, more importantly a castle and a (space) mountain greeted us! We headed down to Roaring Fork to pick up our refillable mugs. 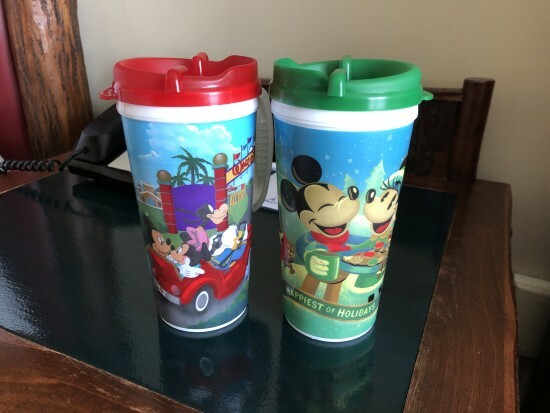 They only had regular mugs out but after seeing someone else do it, I asked at the counter if they had holiday ones and was given the green one. This isn’t the burgundy holiday gingerbread house mug I’ve seen lots of others with, and I think the colours of the picture look a little off, but it has Pluto so I’m happy! We then took the boat over to MK for a few hours. 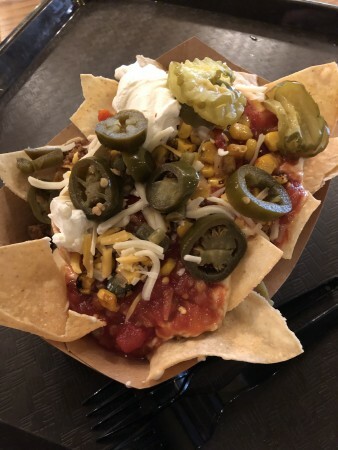 We had FP for Splash Mountain and Big Thunder Mountain first - so in between we popped into Peco Bill’s to use the dining plan for the first time. 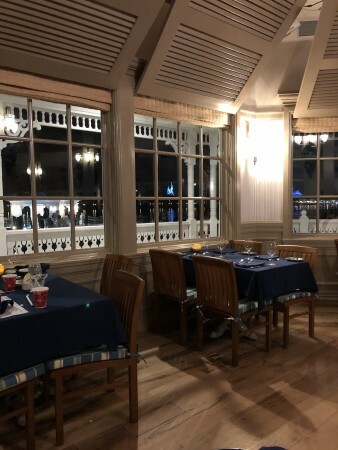 We then used our third FP on Peter Pan’s Flight, used the regular line for Buzz Lightyear and then decided to head back to the hotel to get ready for dinner. Getting the boat back was a bit of an ordeal, because MK was closing for MVMCP and everyone was leaving around the same time, but we made it! We showered and changed for dinner at Narcoossee’s and left about 90 minutes before our reservation to make sure we had enough time (after the earlier boat fiasco). This trip was much smoother - we got the boat to MK then decided to take the resort monorail, mostly so we could quote the Simpsons at each other (that’s more a Shelbyville idea). We looked around GF for a while, saw the gingerbread house, got our picture by the Christmas tree, and witnessed a proposal (she said yes thankfully). Then it was time for food. I had been explaining the intricacies of the dining plan to DH for some time but he doesn’t appear to have been listening that well. 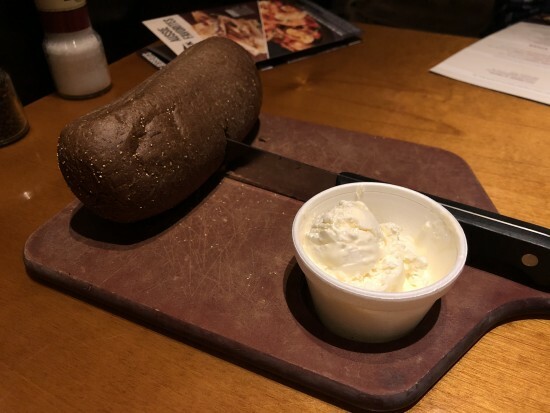 Our server told us we could we could swap dessert for the salad or soup, but as she walked away DH declared he wanted both soup and dessert, so I agreed we could pay for apps out of pocket (even though I knew it would be too much food - he had to learn!). 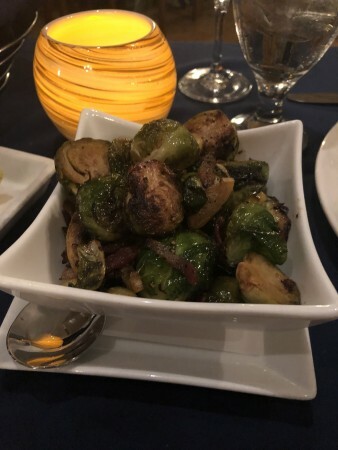 I also agreed to a side of Brussels OOP because we both love those...at least I talked him out of the bottle of wine! What happened to the man who only wanted free food? 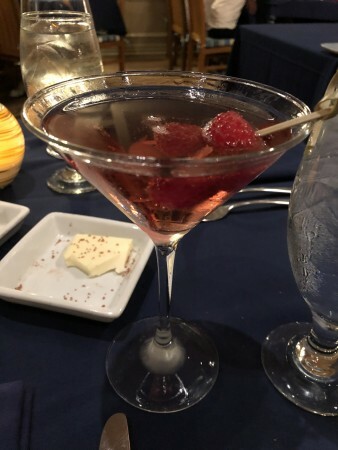 Drinks first - I had a Grand martini, which is Grey Goose Vodka, Chambord, and a Splash of Moet & Chandon Brut Imperial. I enjoyed this, which was not unexpected given I like all the components! DH had a glass of Pinot Gris. 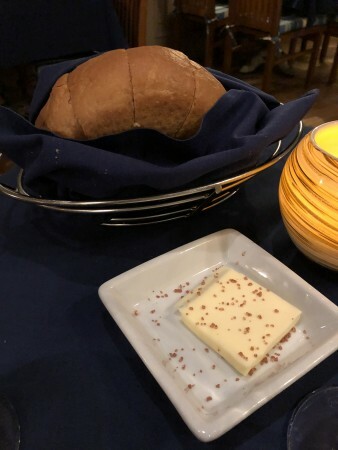 Bread service - sourdough and salted butter are right up my street so it was a struggle not to eat all of this! We could see the castle from our table, which was cool. with House-Made Parisian Gnocchi, Shiitake Mushrooms, Virginia Ham, English Peas, Preserved Meyer Lemon Emulsion Cream. 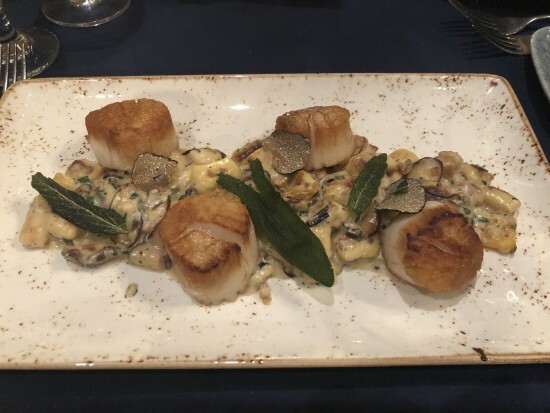 The scallops were perfectly cooked, the gnocchi light and I loved both the mushrooms and truffle shavings, but the cream sauce was too rich for me to be able to finish the portion - I knew going in that would probably be the case as I generally prefer lighter sauces but my love of the other ingredients swayed me to pick it. It was still delicious, just too much! Toy Box Tomatoes, Marble Potatoes and Basil Aioli. 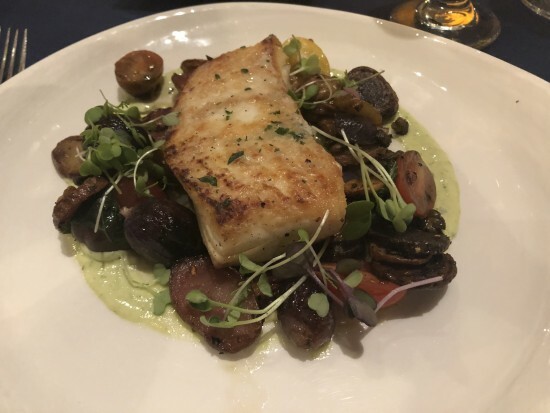 Fish is his favourite thing and unfortunately he felt the halibut was overcooked, making the texture unpleasant. He still ate most of it and also thought the side of roasted Brussel sprouts was a good choice. Onto desserts. DH loves sorbet so was eyeing up the mango sorbet - I warned him that the no sugar added desserts aren’t always up to much but he ignored me (again) and ordered it anyway. 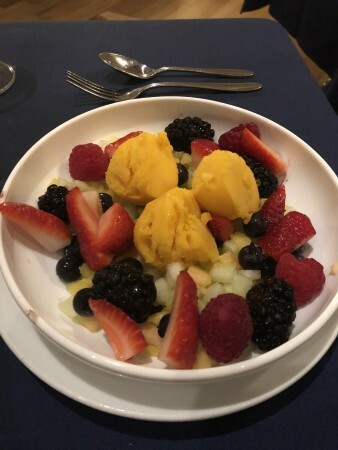 He soon regretted it - the sorbet was three tiny islands in the middle of the sea of fruit, and it was very very frozen. 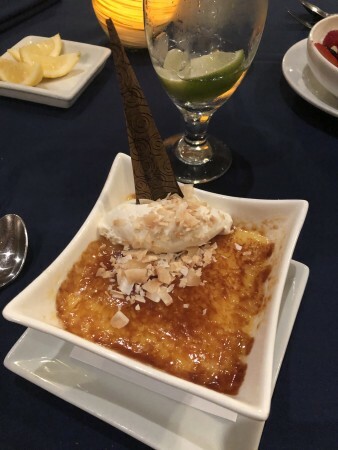 I, meanwhile, am a creme brûlée fiend so I knew I had to have the Coconut and Chocolate Creme Brulee - Layered Coconut and Chocolate with Whipped Chantilly Cream and Toasted Coconut. It was divine and I wish I could eat it again right now. 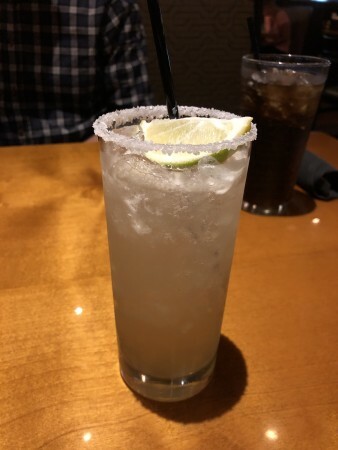 Since DH had disregarded all of my instructions about ordering extras, I’d also decided to throw caution to the wind and have a dessert cocktail. 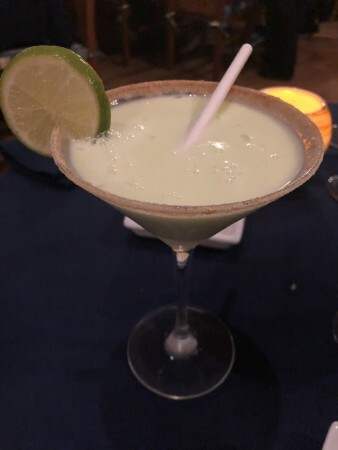 I ordered the Key Lime Martini - Absolut Elyx Vodka, Midori Melon Liqueur, Vanilla Cream & Graham Cracker Rim. 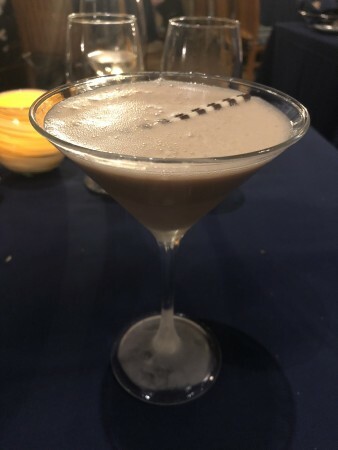 I thought the chocolate stick was weird and when I took my first sip I knew why - it was because it was an espresso martini. I do like those too and in my younger years would probably have meekly accepted the wrong drink, but now that I’m older I find it much easier to assert myself (in all the times I’ve done it, no one has died!) so we called over the waitress and politely (I’m still British after all) explained. Soon enough the wrong drink was replaced with the right one. It was the right pale neon green colour but didn’t really taste much like a key lime pie. Just before 10pm we paid the check - the bill before credits were applied was $212 but in the end the meal cost us 4TS credits and $48 for the extras. We tipped $40 in cash. I know you’re only supposed to get one alcoholic drink on the plan but I can see we didn’t get charged for my second cocktail; whether that was due to the mix up or not, I don’t know. 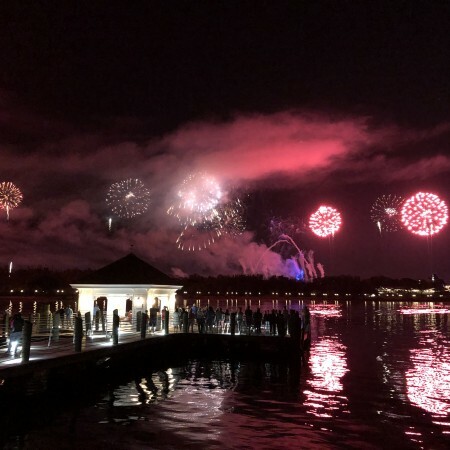 We topped off the night by watching the MVMCP fireworks from the restaurant’s veranda.